Boat licence courses are offered on most weekdays and weekends. The day includes a theory lesson and a written multiple choice assessment that will take place in our comfortable classroom at Runaway Bay Marina. 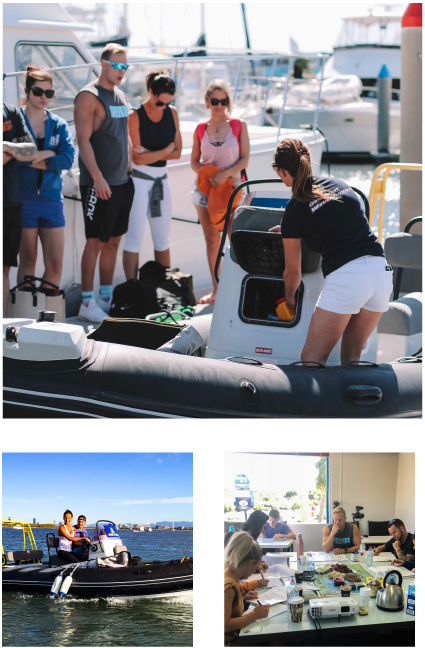 A practical component will also be completed on our vessel, the rib inflatable 570 BRIG Navigator where you will be able to learn, practice and demonstrate your knowledge on the water and practice your boat handling skills. You can either bring your own lunch and store it in our fridge or buy lunch from the popular cafe at Runaway Bay Marina, Kleins. Make sure you bring a hat, sun cream and a jumper or wet weather jacket in case it gets cool out on the water. Make sure you bring your drivers licence or some form of ID (passport) on the day. Please call 0487 895 683 for prices for group bookings over 4 persons.